Can you imagine the most innovative and creative minds of the world gathered in one place? If you don’t think that’s possible then Dubai Design Week will prove you the opposite. Every year, during the Dubai Design week designers from all over the UAE and the rest of the world, come together to show their works and share their products. The level of creativity reaches eternity and you keep asking yourself how human beings can come up with such great ideas. Carry on reading to find out more about Dubai Design Week. When it comes to fashion, boundaries disappear. It doesn’t matter what part of the globe you are from, if you have a good idea and want to show your works to the public then Dubai Design Week is your go-to event. This is where creativity and innovation meet diversity and turns into something great. Dubai Design Week seeks to present the world the talents of the United Arab Emirates and hosts the other designers from all over the world. Dubai Design Week has been around since 2015 and was established by Art Dubai Group. The event takes place under the sponsorship of the Vice Chairman of the Dubai Culture & Arts Authority, her Highness Sheikha Latifa bint Mohammed bin Rashid Al Maktoum and Dubai Culture & Arts Authority, Meraas and Audi. Dubai Design Week aims to not only exhibit the works of designers in runway shows but also educate them and allow them to share their experience and grasp knowledge from other specialists of the field. The event consists of panel discussions, public performances, and educational workshops. Dubai Design Week is always looking for interested partners to work with. For the sake of objectivity, there are application forms that need to be completed. Dubai Design Week provides a wonderful opportunity for fashion-oriented organizations to be in public, meet new people and be featured in media. If you think that you can offer high-quality services to assist the organization of one of a gorgeous events then you might be the next partner of Dubai Design Week. 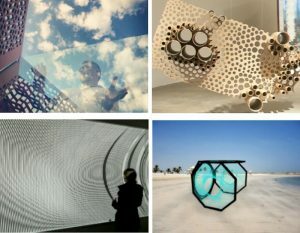 This year Dubai Design Week is going to take place between November 13 and November 18. You know, how there are things that can’t be explained well and you should see them. Dubai Design Week is one of them, whether you’re interested in fashion or you’re just a tourist, attend an event and you won’t regret.